McALLEN — Hidalgo County youth have another opportunity at a clean slate with the launch of McAllen ISD’s first offender program. The program received approval from the Hidalgo County Board of Judges earlier this month and already has three student participants, with two more starting Tuesday. 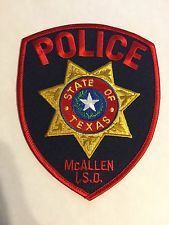 The voluntary program is run by the McAllen ISD Police Department and is open to students who have committed a Class A or B misdemeanor or a state jail felony on a district campus. Students must also have no prior arrests. “If there’s a way to avoid putting someone in the judicial system, it’s a win-win for everyone — the students, the district and the families,” McAllen ISD Police Chief Cris Esquivel said. Joey Buitron, a police officer for McAllen schools who runs the first offender program, said the most common offenses he sees on campus are marijuana possession, theft, graffiti and criminal mischief. “We’ve run into a lot of cases where (students) are at the wrong place at the wrong time … and some of these kids deserve a second chance,” Buitron said. For instance, Buitron said a younger student may be asked to “hold something” not knowing that it’s drugs, and fearing to notify a school administrator is subsequently caught in possession of an illegal substance. The three students who are in their second week of the program’s six-week classroom component are all facing possession of marijuana charges. Once they finish the first phase, they will be put on a 90-day probationary period, during which they will meet regularly with Buitron, who monitors their grades, attendance and any disciplinary action against them. If they successfully complete both phases, their criminal record will be cleared as though the offense never occurred. It’s not just the students who are required to participate as their parents must be present as well. Both student and parent attend the classroom component, which covers a range of topics including drug and alcohol resistance, anger management, decision making and violence prevention. District Judge Renee Rodriguez-Betancourt, who presides over the county’s juvenile court, is a proponent of preventative measures that keep youth out of the juvenile justice system. McAllen ISD is now the second district in the county with a first offender program. La Joya ISD launched one in fall 2015, becoming the first school district in the state with such a diversion program. Buitron worked with the district when developing McAllen’s program. The Mission Police Department started a first offender program this past summer, graduating three students on Feb. 15, and the Pharr Police Department became the first in the county to have such a program when it started one in spring 2015.